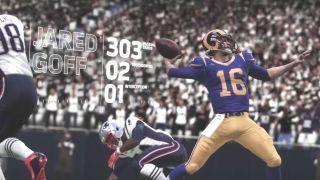 This Sunday sees the Los Angeles Rams and New England Patriots go helmet to helmet in the greatest show on turf – and EA’s annual Super Bowl prediction, carried out in Madden 19, has tipped Sean McVay’s bright young things to shock their more experienced counterparts. Given the Patriots’ infuriating knack of winning every time, they’re predicted to lose this almost certainly guarantees sixth rings apiece for Tom Brady and Bill Belichick, but fans of the 31 other teams can at least hope it comes true. Unlike last year, when Madden incorrectly tabbed New England to trump Philadelphia. Pleasingly for the neutral, it’s set to be a titanic battle which goes right to the wire. Tom Brady is serviceable if unspectacular, racking up 287 yards with two touchdowns and one interception. James White notches 100 yards from scrimmage to go with a TD, while on the opposite side of the ball Aaron Donald earns four sacks. However, that seems an unlikely statistic given that the Patriots are yet to give up a sack in this year’s playoffs. Madden 19 is out now. Super Bowl 53 takes place at the Mercedes-Benz Stadium in Atlanta this Sunday (3 February) with a start time of 6:30 pm Eastern, 3.30 pm Pacific, and the 11.30pm UK.